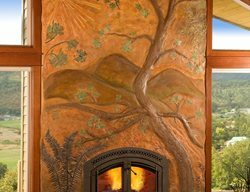 Read about a concrete fireplace designed and installed by Pourfolio Custom Concrete. 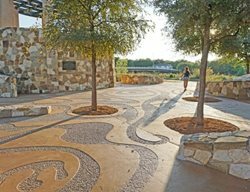 See the rest of the 2013 Scofield Decorative Concrete Award Winners. This basement area had glue down vct, which was removed. Then the concrete was ground and cleaned. The artwork was a printout from the homeowner, which was made into a template. 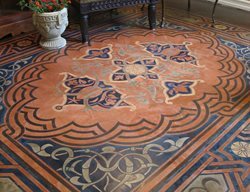 Each color was applied by hand, then the rest of the floor was dyed, sealed & waxed. The floors in this basement were refinished to complement the room's decor. The contractor combined multiple colors in an organic fashion. colors were applied very thin in two different intensities with the darker colors on the bottom and the lighter colors on top. 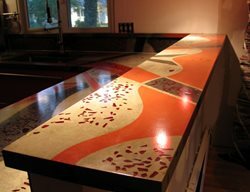 After each color application, the floor was sanded with a large orbital sander and then by hand with a palm sander to avoid trowel marks. Get this look using Colormaker's Scrafino, Colormaker Colorfast pigments in Burnt Umber, Verde, Cork, Charcoal, and White (un-pigmented). 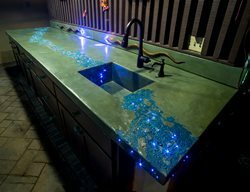 This concrete vanity sink was based on a Fender stratocaster guitar. The concrete mix was 5000 psi, Quickcrete with a little extra portland and some liquid fortifier. Davis black was added to the mix to get the dark color. The mold, made from a tracing of an actual guitar, consisted of foam and body fill coated with resin. The piece has a full wire and rebar cage. For the final touch it was slurried, wet sanded, sealed and waxed. 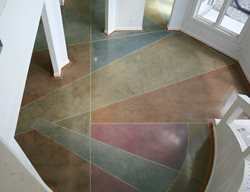 Winner of a 2012 ASCC Decorative Concrete Council Award - Second Place Certificate in Concrete Artistry, Under 5000 SF. This floor's free-form floral design was created using PVC pipe and pieces of metal cut into swirl and leaf shapes. Get this look using Scofield's Lithochrome Chemstain in Padre Brown and Kemiko's Stone Tone acid stain in Black. 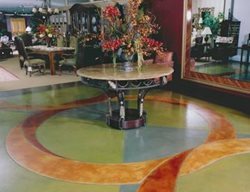 For the second year in a row, the Grand Prize from Scofield's Decorative Concrete Awards was given to Lou DeCillis of Artistic Flooring Systems of West Bloomfield, MI. for his innovative use of stain work on the floor for Lido Gallery and Gifts. 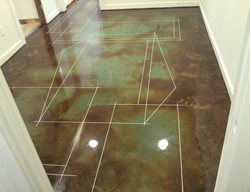 Even though this wasn't a large job (the lobby and reception area for a new art gallery), the owner wanted a very dramatic and stunning floor. "Art on the floor," was the way DeCillis described it. 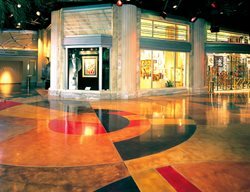 Described as "an impressionist painting on concrete" the floor was created with a combination of LITHOCHROME® Chemstain® Classic, LITHOCHROME® Tintura™ Stain and SCOFIELD® Formula One™ Liquid Dye Concentrate, then sealed with SCOFIELD® Selectseal-S™. 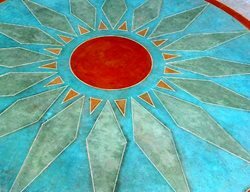 Departing from the "graphic design" look of most decorative concrete artisans, DeCillis used the colors in a loose, painterly fashion, creating a floor that is as much a work of art as the pieces that the gallery houses. 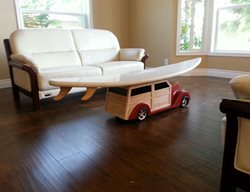 This Cal State Sacramento recreation room was scored and then acid stained in multiple colors and epoxy sealed. 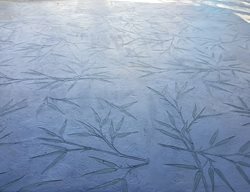 A salon floor pattern created from the design of the owner's tattoo. Vanity, part of a complete bathroom design. 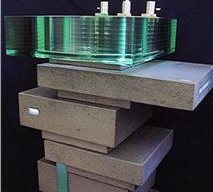 Monolithic patterned surface radiating out from integral sink. Client specifications were of color and contrast with reds, blacks, and whites. Unique vanity shape accommodates lower make up area and front radius vanity top. Irregular curved shape maximizes surface area without cramping limited overall bathroom space. A concrete floor colored to look like a map of the world. Faux painting of flowers in a vase on a concrete floor.